We’ve seen nominal inflation of 43% since 2000. That doesn’t sound so bad, does it? After all, it’s just an average of 2% annually. But what does that number really mean? How does it really apply to your life? 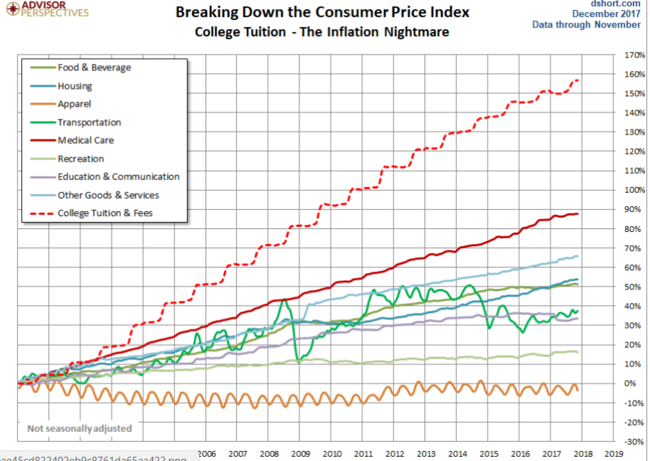 Do you have a dependent in college this year, in a market where tuition has risen 160% since 2000? Is *your* inflation rate really 43% since 2000? Remember this the next time you hear someone making sweeping conclusions about the economy’s overall health, often being made on the basis of a supposedly benign and under-control overall inflation rate.